Dr Ralph Gonsalves, Prime Minister of St Vincent & the Grenadines, delivered the 2nd Annual March 13th Lecture at the Grenada Trade Centre on Monday, 14 March 2016. 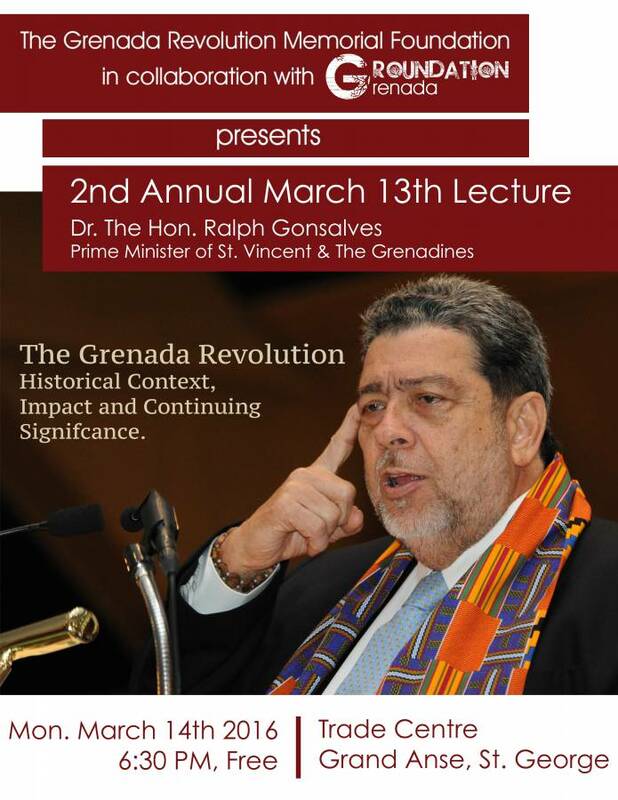 Prime Minister Gonsalves is the second OECS Prime Minister to deliver the March 13th Lecture, launched in 2015 by the Grenada Revolution Memorial Foundation (GREMFO) in collaboration with Groundation Grenada. The inaugural lecture was delivered in 2015 by Prime Minister Roosevelt Skerritt of the Commonwealth of Dominica. GREMFO is a non-profit company, whose objectives include working towards the achievement of a fair and balanced assessment of the impact of the Revolution on Grenada and the wider Caribbean; preserving the positive memories of the Revolution, and fostering a spirit of reconciliation among persons affected by the Revolution and its demise. Groundation Grenada is an organization comprised of young Grenadians working to raise critical awareness on social justice issues. In pursuit of its project Forgetting Is Not An Option, Groundation Grenada is committed to preserving and embracing the history of Grenada including the period of the Grenada Revolution. 13 March 2016, marks the 37th Anniversary of the Grenada Revolution. Students of history were especially encouraged to attend the lecture which focuses on a critical period of Grenada’s development. An articulate and persuasive speaker, Dr Gonsalves is a seasoned politician, historian and Attorney-at-Law. He holds a BSc in Economics and an MSc and PhD in Government. He has authored several books and pamphlets touching and concerning history, politics and developmental issues. The Inaugural lecture in 2015, delivered by Prime Minister Skeritt, focused on “The Grenada Revolution and the Current Foreign Policy Challenges of Small Island States”.